We now offer IDD Therapy for trapped nerves. This is a new technology that is the fastest growing treatment for trapped nerves in the UK. Trapped nerves happen for different reasons and can be difficult to treat which is why IDD Therapy is revolutionary. 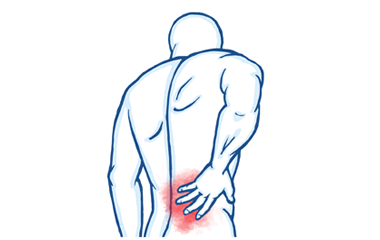 Degeneration in the lower back is one of most common causes of trapped nerves. As people get older, the effects of everyday use accumulates and causes wear to the vertebra, facet joints, discs and soft tissues that make up the spine. Lumbar spondylosis is the collective term for this process. Soft tissue structures (by this we mean muscles and ligaments) in the spine help control movement of the spine. They are also the main tissues surrounding the spine and by virtue will be involved in most injuries. Other muscles that are common sources of discomfort are those that surround the shoulder blade (scapulothoracic muscles). These are integral to shoulder movements that involve throwing or lifting. Ligament injuries may contribute to spinal pain although it is hard to establish to the extent of involvement. We are specialists in treating trapped nerves and our IDD Therapy provides a safe, gentle and non-invasive solution. Sciatic nerve impingement can occur at any of the bottom three vertebra of the lower back. The sciatic nerve travels down the back of your leg. There is also another nerve in the lower back called the femoral nerve that originates from the mid-lumbar spine levels. For a full description of why this happens and what symptoms these conditions cause click onto 'find our more....' below. There are various conditions that affect the spine and the most common of which are outlinned here. 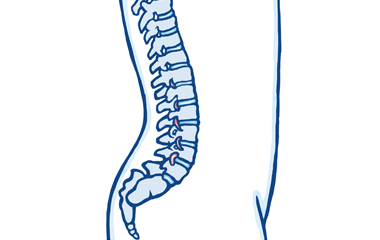 Spondylolisthesis is a condition in which a veretebra in the lower back slides forward over the vertebra below it. 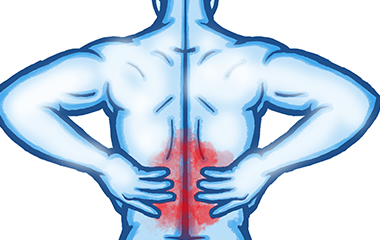 You may not be aware of any symptoms but it can be a common cause of general lower pain lower back. 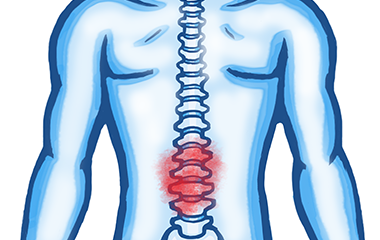 Ankylosing spondylitis is an inflammatory condition that generally affects young adults. It leads to a progressive stiffening and restriction in the spine. Scheuermann’s Kyphosis occurs when the front of a vertebral body does not grow as fast and develop as quickly as the back of the vertebra. 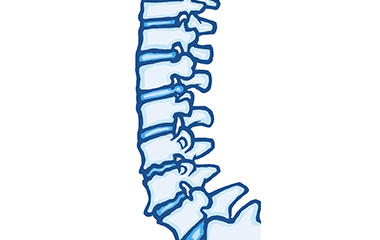 The vertebra therefore becomes wedge-shaped and this typically occurs in the mid-back area. Osteoporosis is another common condition that affects us all as we grow older (although it can occur at an earlier age in ladies) . This is characterised by loss of bone density, as most of us already know. The middle of your back has an outwards natural curve called a kyphosis and your neck and lower back have a natural inner curve called a lordosis. A small degree of both kyphotic and lordotic curvature is the ideal. However too much curving in the lower back is called ‘swayback’ (or lordosis) and a curve of more than 45 degrees in the middle of your back (or kyphosis) is also considered excessive. 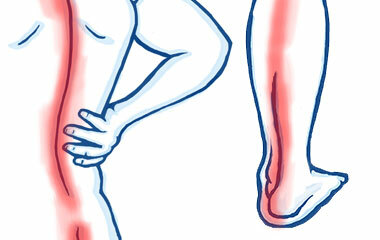 In both instances pain and stiffness can be evident as the body struggles to cope and compensate. Scoliosis is when you have a sideways curvatuture in your spine at an angle of more than 10 degrees that doesn't go away when you bend. Scoliosis mainly affects children but there is also an incidence rate in adults.